Using a mirror to dress up a part of your home is a simple choice with the decorative framed Harvest Wall Mirror by Kate and Laurel. It is a beautiful addition to any wall and an essential element in your home decor. An easy way to revamp a space, the 21.5 x 27.5-inch rectangle frame is the perfect size to add a stylish statement to a hallway, bedroom or living room or even place two on adjacent walls for opening up the space in a smaller room. 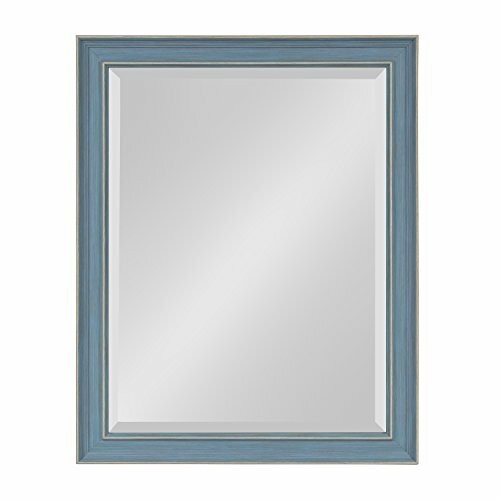 The rustic modern look makes it a natural selection for your bathroom either as wall art or a practical vanity mirror. The frame has a beautiful wood-grain like finish made of a lightweight, easy to hang material. Sturdy D-ring hangers come installed on the back allowing for portrait or landscape display for optimal flexibility that works for you. The frame profile is an attractive 2 inches wide with the Kate and Laurel signature Harvest edge design. The distressed look of the frame adds to its farmhouse style charm and would look great in a kitchen hallway or dining room too. The beveled mirror has a 17.5 x 23.5 surface that adds to the overall appeal of the mirror and also reflects lots of light, brightening up any space.